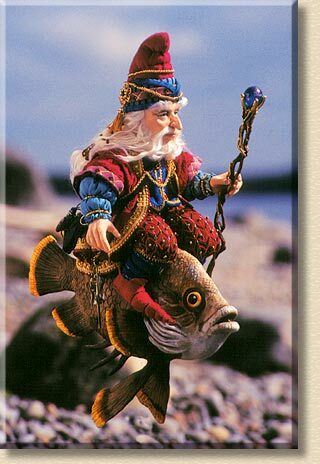 All dressed in fine fabrics and based on an illustration by James Christensen, this gnome wizard catches a ride to the wizard's gathering. Media: Head and hands of Super Sculpey, on a wire armature, with a cloth body. White mohair beard, eyebrows and hair. Wearing a blue and purple hat with gold and beaded trim. Wearing purple leather shoes, blue beaded socks, and beaded red brocade pants. Wearing a blue brocade vest with gold trim, and blue under sleeves with gold beading. His coat is purple brocade with gold trim. He has a handmade leather bag over his shoulder, on which sits a handmade bug. In his left hand he holds a staff made of twigs, Super Sculpey and a glass marble. He sits on a fish. Fish: Entirely sculpted of Paperclay over a wire and aluminum foil armature. Painted with acrylic paints. Supported by thick wire protruding from a chunk of driftwood.